A sequence of bases in DNA that .codes for the synthesis of One polypeptide is called gene. The genes must transmit their information from the nucleus to the cytoplasm. Therefore, protein synthesis occurs in cytoplasm. 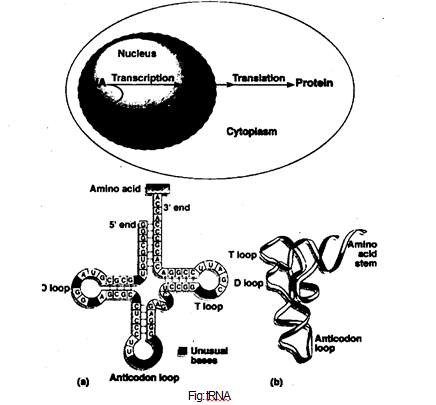 The synthesis of an RNA molecule from DNA is Called transcription and the formation )f a protein from RNA at the ribosome is called translation. There are three major kinds of RNA. Each RNA has a specific role in protein synthesis. All the RNA are produced in the nucleus from DNA. a) Messenger RNA (mRNA) is a linear strand. It carries a set of genetic instructions for synthesizing proteins to the cytoplasm. b) Transfer RNA (tRNA) picks up amino acids in the cytoplasm and carries them to ribosomes. It joins these amino acids for the synthesis of polypeptide. 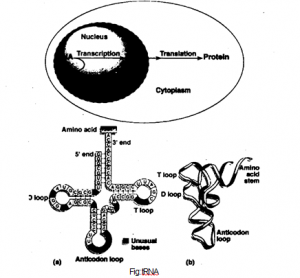 (c) Ribosomal RNA (RNA) with proteins makes up ribosomes. 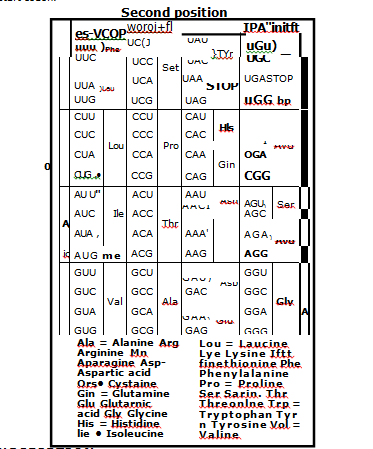 (a) Termination codons: The base sequences UAA, UAG, and UGA are stop codes. They indicate the termination point of the polypeptide synthesis. 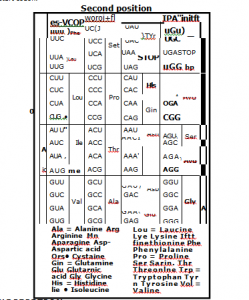 (b) Initiation codon: The codon AUG codes for the amino acid methionine. It is a start codon. • They also modify the mRNA after the completion of transcription. Initiation: RNA polymerase is the important enzymes which take part in transcription. A section of DNA is unwound. RNA polymerase recognizes a specific sequence of DNA nucleotides. RNA polymerase attaches on these specific sites. Elongation: RNA polymerase starts joining complementary ribose nucleotides to the 3′ end of the DNA strand. The same complementary bases paired in DNA. But in RNA, the base uracil replaces the base thymine. Thus uracil complement to adenine. Termination: Transcription continues. Finally, RNA polymerase reaches the termination sequences. Thus transcription stops. 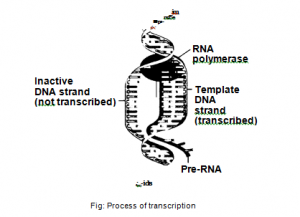 Processing of primary transcript: The newly transcribed mRNA is called the primary transcript. It is modified before leaving the nucleus. Some base sequences in newly transcribed mRNA do not code for proteins. RNA splicing cut out these noncoding regions. Thus the mRNA coding region can he read continuously at the ribosome.